Delhi continued their impressive turnaround in Indian T20 2019, beating Hyderabad by 39 runs on Sunday, thus climbing to the second spot in the points table, behind Chennai . 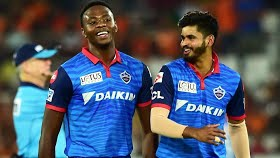 After the 40s from Shreyas Iyer and Colin Munro lifted Delhi to an average 155 for, Hyderabad stumbled from 72 for no loss to 116 as Kagiso Rabada, Chris Morris and Keemo Paul combined to finish off Hyderabad. It was a spectacular collapse for Hyderabad as they again showed their over-dependence on David Warner and Jonny Bairstow, who contributed 51 and 41 respectively. Following the win, Delhi captain Iyer was extremely pleased with his team's performance, even going to the extent of replying in the affirmative when asked whether the team believes they can win Indian T20 2019. "We are believing so and it's never too far," Iyer said about his team's chances. On his crucial partnership with Rishabh Pant, he added, "It started to slow down. I and Pant had decided so that one of us will take the charge. We got a little cameo from Keemo and Axar and helped us get to that total." Kagiso Rabada, who led the way in the bowling with 4 for 22, said, "We have our game plans and all that we try to do is to stick to it. We hope it goes our way and more often than not, it should go your way. "It's been the trend so far, you need to have variety in your pace. We try to talk about change-ups especially if wickets are assisting those type of changes. It worked for us today." Keemo Paul, who was named the man of the match for his 3 for 17, said, this is a dream come true for him. "It is the biggest league in the world and why not enjoy it. Went back of the hand and it worked for me. I just tried to adapt to the wicket, just bowled to suit the wicket. The slower balls were gripping. This game is all about confidence. I have not been getting much to contribute with the bat so wanted to contribute more."